Pros: Appealing design and build quality. Frugal engine for better mileage. Available in wide ranging colours. Presence of telescopic suspension for comfortable ride. Large voluminous storage spaces for luggages. Cons: Riding and Handling is not up to the mark. Absence of digital instrument cluster, glove box, disc brakes, combi brakes, foot board area etc. * Prices of Yamaha Ray models indicated here are subject to change and for the latest new Yamaha Ray India prices, submit your details at the booking form available at the top, so that our sales team will get back to you with the latest prices, offers & discounts. 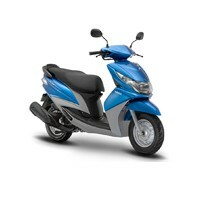 Yamaha Ray average mileage mentioned here is based on ARAI based on standard test conditions.